I bought this book because freelance writing has been fun, but a business challenge. 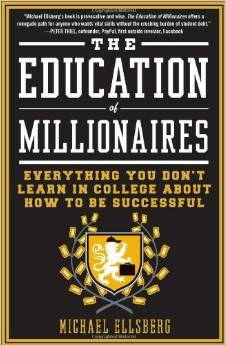 The subtitle caught my eye: Everything You Won’t Learn in College About How to be Successful. Well, that wouldn’t be too hard. Between my English literature and technical writing degrees, I didn’t find a lot of time for real-world business skills. And that deficit in my college learning is what the author is trying to correct. I found his advice well worth reading. Using interviews with multiple millionaires or billionaires–most of whom dropped out of high school or college–Michael Ellsberg illustrates what he defines as seven “success skills” necessary to make money. I don’t think I’m giving away too many trade secrets by listing them here (it’s akin to opening the front matter in the book store and checking the table of contents). Those chapter titles might intrigue you or strike you as utter bilge. I was hooked because I’ve been in need of some concrete tips for months now. Unlike some of Ellsberg’s subjects, I did graduate, went back to school to get a higher degree, and that paid off in the form of better jobs and opportunities in the defense and space industries…at least up to the point where I got laid off. Left to myself, I could have looked for the next tech writing job in the want ads and remained in Huntsville. I decided it was time to take the leap, become self-employed, and do what I wanted to do. In that case, I handled chapter one. Mentors I’ve got, though I keep looking around for advice from others when I think they can help. Where I knew I needed help was in marketing and sales, which surprised me a bit since I’ve worked as a marketing guy for a good chunk of my career. However, Ellsberg inverts the usual model of enticing others to want a product you want to sell and focuses instead on identifying individual, personal needs and determining if and how your product/service can help. I wonder how that approach would work at NASA (“We don’t do marketing, we education and outreach”). Ellsberg recommends a couple other good books on how to do things like direct marketing and “high integrity” marketing, which focuses on an individual’s deepest emotional needs without manipulating them into something they don’t want to buy. On the sales side of things, Ellsberg’s book might be worth it just for his referral to the book SPIN Selling, which is the cheapest abridged version of a million-dollar sales study you’re likely to find. Ellsberg’s definition of investing for success might lead one to think he’s about to provide investment tips for your portfolio. Instead, he focuses on investing in your own ad hoc education–learning what you need to learn to run your business and succeed. On the subject of brand building, I was already there: he emphasizes building a positive online presence. Google my name, and you get either me or a minor league baseball player. Most of the rest of the top ten entries, however, are me. So that’s good, I suppose. But until last night, I didn’t have the “BartLeahy.com” domain. The things I do for business development. If the author has one key message here, it’s that most of the jobs that are filled are not posted online, and yet that’s how most people do their job hunt–silly, no? Lastly, when it comes to the “entrepreneurial mindset” vs. the “employee mindset,” I’d have to say that this has been the biggest change I’ve had to make to progress as a professional. What’s the difference? An entrepreneur is not too proud to take a scut job on the way toward something better. They’re looking at the job as a learning opportunity while they’re working on getting somewhere else. An entrepreneur looks at any downturns or unpleasant circumstances as temporary, not as permanent, inevitable, or the result of some big conspiracy to “keep a hard worker down.” Someone with an employee mindset, according to Ellsberg, is essentially in the perpetual role of the supplicant and looking to others’ goodwill for income and advancement. To think entrepreneurially–even in an employee role–means to seek out ways to make changes and improvements within (or event beyond) your authority, to seek out greater responsibility, and to constantly seek opportunities to improve themselves or the workplace. I didn’t stop thinking like an employee until my smart mouth got me a writeup and I realized I had to shape up or I was going to be stuck in that job or something like it forever. So when you add all this insight and the many rags-to-riches stories together, you find yourself with a lot of insights into how diverse individuals can work themselves out of a job and into a career. Along the way, you’re treated to some great resources for improving yourself. I commend Ellsberg for not writing a get-rich-quick book or, worse, a get-rich-through-positive-thinking book. Ellsberg makes it clear that the educational and entrepreneurial processes require work, time, patience, and commitment. He also makes it clear that entrepreneurship does not require a college education. Much of the epilogue and later-version follow-up notes respond to criticism from people in the academics-are-required-for-success community, and he hits you with a lot of horrifying statistics about the amount of money spent on higher education compared to return on investment. The results are depressing and a little scary. Ellsberg compares the academic system to the housing bubble, with “investments” turning into mere consumable commodities. I accepted the credential game, going for an M.A. to prove that I could speak technology (my experience up to that point had been Disney and English lit), and the bet worked. I paid off my loans in a reasonable amount of time because I was attending a state school in Florida, not an Ivy League university, like Ellsberg and many of his interviewees. Still, as a freelancer now, I’m not waving the diploma around as a way to drum up business–I focus on the work I’ve done and can do. Obviously there are some other things I need to work on, but clearly I was a good target audience for this book. I loved it and plan on recommending it to a couple friends as well as my sister and brother-in-law as food for thought when raising their kids. Do they really need college to succeed in an uncertain future? Maybe. But they also need the “street smarts” to start a business, something that our current education system just does not do. If you want to identify the basics, this book is a good place to start.